STORY: Angry protesters in India’s central Bhopal city marched the streets on Monday (December 03) to mark 34th anniversary of one of the world’s deadliest industrial disaster, the Bhopal gas tragedy that killed thousands and left many terminally ill. Protesters carried banners and placards and raised slogans to condemn government’s failure in delivering justice to the victims and their families even after 34 years since the tragedy happened. In the early hours of December 03, 1984, around 40 tons of methyl isocyanate gas accidentally leaked from a pesticide factory owned by American Union Carbide Corporation and was carried by the wind into the surrounding slums in Bhopal killing over 5,000 people. A day earlier, on the night of Sunday (December 02), a torch rally was held in the city to remember the victims of the tragedy and put pressure on the government to stop merger of American companies Dow Chemical and DuPont that will reportedly result in disappearance of U.S. multinational, Union Carbide, where the gas leak tragedy happened and thus help it to escape any punishment or legal obligation. The government recorded 5,295 deaths in the tragedy. Activists estimate 25,000 deaths from illnesses since the leak. Many people still suffer from cancer, blindness, respiratory problems and immune and neurological disorders, with little support, they say. 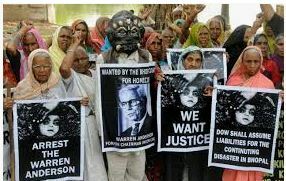 Dow Chemical, which now owns Union Carbide, has denied liability, saying it bought the company a decade after Union Carbide settled its liabilities to the Indian government in 1989 by paying $470 million.